100 years ago Hunthill Road looked very different. 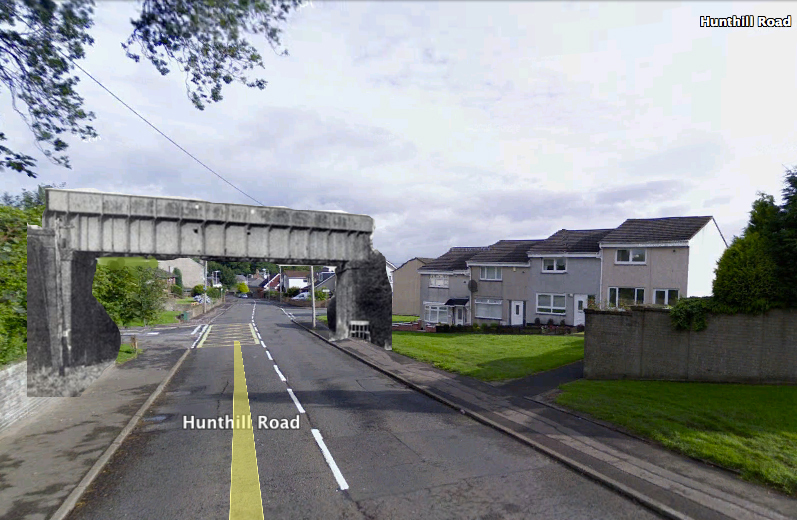 The High Blantyre Train line ran directly over the road on a bridge at this location. There was no Stonefield Crescent. The houses on the right obviously weren’t built and were only fields with only “Old Place” (The Coachhouse) sitting in the field on the right. The line was on a raised embankment which still exists on the left today behind Armour Court as a walkway. The raised embankments that would have gradually sloped downwards from the bridge on the right were removed when the housing estate was built at Stonefield Crescent in the 1920’s. I’ve made a mockup of how this picture would have looked like, overlaid on a modern photo. Was your uncle Ian McCorkindale then? Our family knew Ian and Ina very well in all their time they stayed at 2 Stonefield Crescent. We lived only 4 doors from them. I have photos of the house during 1930s. Hi, since writing this article i found out the Stonefield Crescent houses were built in the late 1920s. This was my home and confirmed as my family bought one at number 10. Maybe some were built earlier? I agree the modern homes on the right were built in the 1960s and the railway did indeed cut through Broompark, over to Victoria Street to Auchenraith then down to Glasgow Road, branching off in junctions to Whistleberry and to Hamilton. I’ll add your comment to the story as further first hand history is good to record too. Thanks. Your history of the area seems to be incorrect, as the cottages on Stonefield Crescent were erected during the early 1920’s as homes for hero’s 1914-1918 ww1, I can comment on this as my grandfather & mother lived @ 2 Stonfield Crescent & this was the family home untill the death of my uncle in 2008 @ the age of 88 years. The houses to the right hand side were built in the 60’s & prior to that the railway embankments together with a signal box stood slightly to the right of down side abuttment.